Asset tracking: Manage wide range of asset information such as serial numbers, location and usage with seamless integration with READYSOFT financials. Comprehensive Maintenance Management System using best practices to manage the full lifecycle of an asset. Material Management: Monitor and control storeroom inventories with tools that include economic order quantity with class calculations and assignments, support parts receipts, issues, returns, and cycle counts. 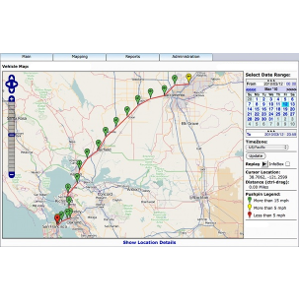 Live Map Tracking to monitor your fleet in real time on map and Dnamic Status window. Geo Fencing by Creating your Geo-Zones and receive alerts when vehicle enters or leaves the zones. Alert Monitor to control driver behavior and fuel wastage with real time alerts for over-speeding, idling, etc. and receive notifications from on onboard sensors. Reporting & Analysis with comprehensive set of reports on trip summaries, alerts, over-speeding, etc. with in-depth analysis tools. Comprehensive Reporting with extensive canned/ad-hoc reports to gain important insights to Assets, Expenses, Fleet, etc. 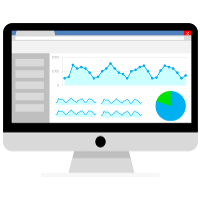 Readysoft AMS Analytics covers various dashboard areas like Asset Summary, Maintenance Cost Summary, Work Order Summary, Inventory & Costing & Fleet History. Executive KPIs Dashboards provides a complete 360 degree view of the entire Asset Management System.